Paramedics in the north east of England will wear body cameras for three months in an initiative to tackle violence and aggression towards staff. The North East Ambulance Service (NEAS) NHS Foundation Trust has given the cameras to around 40 of its front-line employees. The scheme was established following a 23% rise in the number of physical assaults on NEAS staff in the past year. Camera footage obtained in the event of an assault or abuse will be admissible as evidence in court. NEAS paramedic and clinical care manager Ben Barber said: ‘Unfortunately these incidents are increasing and I see this as a really positive measure. The Assaults on Emergency Workers (Offences) Bill is due to come into force next month, meaning people found guilty of common assault on emergency workers could face a maximum prison term of a year rather than six months. 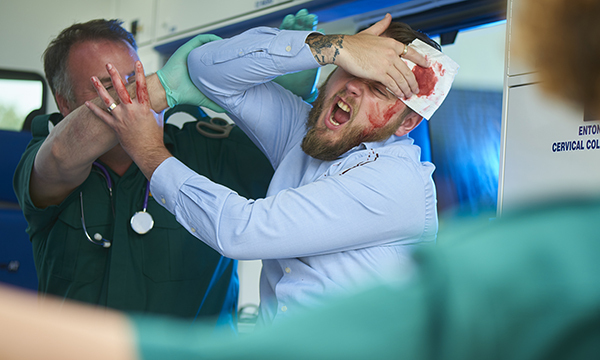 RCN national officer Kim Sunley said there were 75,000 assaults against NHS staff in 2016-17, and anything that reduces the high incidence of violence is worth exploring. ‘No one should be assaulted at work,’ she said. ‘These attacks can cause severe injury, as well as mental trauma that can last for years. Yet too often assaults are seen as part of the job by employers. The use of body cameras in nursing was the subject of heated debate at this year’s RCN congress.